When pond weeds and aquatic plants take over all is not lost. I have seen so many pond that have been practically ruined by aquatic plants! Many invasive rooted aquatic plants can wreak havoc by literally choking out a pond. Milfoil, Hydrilla verticillata or Hyrdilla, Vallisneria spiralis or Eel grass, Potamogeton crispus or Curly leaf pondweed, Typha anqustata or Cat-tails are all common pond weeds that can ruin the aesthetics of the shoreline and make the pond or lake virtually unusable. Using chemicals can be a last resort but manual removal, much like weeding out the dandelions from the garden, should be looked on as the very best treatment for these sorts of plant invasions. Of course, the plants are growing in nutrient rich "soils" at the bottom of the pond and these nutrients which form in the muck need to be reduced using combinations of aeration and natural bacteria to ensure that the growth of plants is limited. 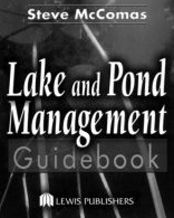 Recently I had a conversation with a member of a lake association who were plagued with lake weed problems. They were at the end of their rope! He told me that it was an artificial lake, was once a sandpit/quarry around 25 years ago that was purchased when water was springing up from below. The sandpit was dug out with many wells used to create a small lake but in the last few years there has been a proliferation of weeds, both [submerged/emergent and this year the weeds are thick through out the lake and there is pungent smell to the water. In the past owners have managed the lake by dragging a huge home made weed rake (iron bars with bolts dragged from a boat) along the bottom which dredged the bottom and removal of floating weeds was performed by the owners. It worked slightly but over the last 5 years each year has seen a dramatic increase in the weeds; there are 3 dominant weeds: a low to the bottom curly weed matting the bottom, a weed from the bottom with a tuber growing to the surface, on the tuber are curly leafs about every 5 inches on opposite sides from the bottom to the top with what looks like a rattle snakes tail protruding from the surface and the 3rd one looks like a pond weed with a long thin vine with a single leaf at the surface. Excellent for controlling lake and pond weeds. Simply skim the weed rake across the water and let it sink. Retrieve with a short push-pull action and drop the weeds on the shore. The long term solution will start with the short term removal of these plants. Using a proper weed cutter and raker as a harvester will take the work out of the job...unless you have a group of neighborhood kids looking for part-time summer employment as weed pullers then you need to use the smartest tools for the job; a cutter and a rake...sounds simple....but it still is a lot of work doing the manual removal. Remove your Lake or Pond Weeds in Minutes with the Aquatic Weed Eradicator, similar to the Weed Razer® weed cutter, the Aquatic Weed Eradicator has a thicker serrated blade on both edges to allow for a push/pull sawing action to be used for touch weed invasions in ponds. 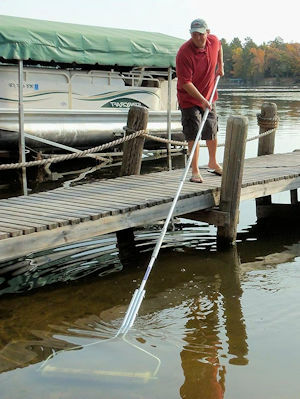 The Aquatic Weed Eradicator is uniquely designed to be the most efficient and effective tool made to cut and removing submerged lake and pond weeds like milfoil and hydrilla. The Aquatic Weed Eradicator's serrated steel cutting blade clears a path 28" inches wide each throw. Weighing in at around 9 pounds it is light enough to toss into the pond and reach the weeds growing further out from the shoreline and it can also cut in deep or shallow water. The serrated blade slices the weeds right at the base of the growing plant so it can rapidly clear an area for swimming or recreation from unwanted invasive weeds. If you have full grown, mature lake of pond weeds within a 25 foot radius from your launch point and you want to cut a 4 foot wide path with each toss, then the Aquatic Weed Eradicator is the perfect tool for you. The Aquatic Weed Eradicator has extremely sharp steel blades. Whatever you want to call it; Weed cutter, Weed Razor, weedrazor, WeedRazor, Weed razor, this is probably the best way to deal with problematic aquatic weeds without using harsh chemicals. The Beachroller is very simple to use and is the long term, permanent solution to having a weed free beach! Simply put roller in the water, roller fills with water and sinks to the bottom. Push the Beachroller back and forth with the 16' handle on the lake bottom. The roller with 6 custom weed cutting blades, cuts the weeds, rips out the roots and blast up the muck. Most weeds get cut off and fly off the roller, so you just keep rolling and do not need to touch the weeds! Overtime it rips out the roots, so the weeds do not grow back. Plus it is blasting up the muck, silt and lake bottom junk, other lake tools miss. Clean it up, then just maintain, using the Beachroller a few minutes when needed, if any weeds or silt tries to move back into your lakeshore area. Everyone will love having a clean, sandy, weed free beach! Gets to the problem... THE LAKE BOTTOM! Cuts the lake weeds. Rips out the roots, so weeds do not grow back. Blast up the muck and silt, getting down to the hard bottom. Simple and easy to use for everyone. Works in very shallow water to deeper water plus hard to reach areas around the dock. Blades never need to be sharpened. No power required. No complex set-up. Lightweight, super strong powder coated 16 foot aluminum handle. Industrial strength snap spring buttons. Quick attach 4' handle sections. I have seen a growing number of weed problems in lakes from Northern Minnesota to Southern Saskatchewan to Western Ontario to Eastern Texas...wow...I think I touched on every compass point but may have missed your state or province....but I've heard of it growing everywhere so don't depair...it's a common problem. Usually, there may have always been areas of a lake that are exceptionally weedy, but in the past four or five years the weeds have moved aggressively into the beach area or near docks and marinas. 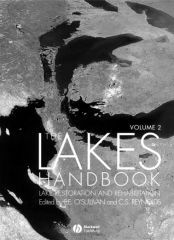 Most clients say the same thing: "I'm not certain that I want to spend thousands on this problem, as there needs to be changes to how the river valley and lakes upstream are managed to have any real influence on the water quality and weed levels in our lake. Having said that, I'd like to be able to clear the area around our dock, and I think the 'weed razer' looks like a product that might make that possible." A proper weed harvester is key to getting the job done fast and without strain or injury. A regular metal rake or a leaf rake isn't designed for the job...you need a light and sturdy tool that has long teeth to really catch and hold the cut weeds and bring in large mats of the debris for removal, or add them to your compost heap! Of course sometimes, especially in the past before strict environmental laws were in place, many residents have gotten permission to use a herbicide in the water to kill their weeds, but cutting and raking really work well to keep the organic material down and help reduce the vicious cycle of poisoning and regrowth! I was once asked about how effective do I think the weed razer would be if you were to drag behind a slow moving boat or sea doo? This may sound like a simple yet effective way to cut them but it is likely more dangerous than smart! Dragging any sort of steel razer or serrated blade behind a moving boat or seadoo is not recommended. The blades could be damaged by striking a rock or log or it could become hooked on some submerged object and damaged the tool or even the boat! Don't risk it. There are products like AquaScreen, which is a screen that is placed on aquatic plants and stops them from growing, that is often thought of as a good way to get rid of aquatic plants. We have used AquaScreen and it is a good product to quickly get rid or hide a weed problem. We sometimes found the AquaScreen was difficult to install, required cleaning too often, and was prone to actually have rooted plants growing on the surface of the screen. The cost of using this sort of benthic barrier is high as much as $0.75 per square foot which does not include installation or maintenance. Using a screen of landscaping fabric or canvas is another do-it-yourself method that isn't very effective at all. It is better to use the UV strengthened AquaScreen if you want to use this sort of barrier method of pond weed control. . The truth is that manual removal is ideal and when a total mechanical excavation by shovel or bulldozer isn't feasible then using an aquatic tool like the cutter and raker is the most cost effective and environmentally safe procedure. AQUARIUS SYSTEMS provides aquatic weed control equipment to cut and remove a wide variety of lake weeds including water hyacinth, Eurasian water milfoil, hydrilla, salvinia molesta, and other aquatic weeds that make waterways unusable. Many other aquatic plants are also easily managed with an aquatic harvester. Contact us today with the name of your lake weed to see if a weed harvester is the solution for you. In addition to aquatic weed control, we also supply trash skimmers to pick up floating trash in rivers, harbors and lakes. Aquarius Systems, a division of D&D Products, is the oldest manufacturer of surface water management equipment in the world. Our complete product line includes aquatic plant cutters and harvesters, floating excavators, canal cleaners and trash skimming vessels. In the 1950s, founder John Dauffenbach developed equipment to battle local aquatic weed problems. In 1964, John and his brother Doug incorporated D&D Products and expanded that early vision throughout the world. Our customers now span the United States and nearly 40 countries worldwide. Continual research and development have taken the equipment in this industry from its crude and cumbersome origins to the finely tuned machines available to you today. Through hands on management and state-of-the-art innovation, we are committed to providing high quality equipment, exceptional customer service and timely factory support. The V Shaped Razor Edged Cutter WeedShear *GREAT CHOICE for CUTTING long or short weeds, excellent on lily pads and with some additional work - even cut cattails. Store in a safe place - The WeedShear is Very Sharp! For Cattail Removal. (if you cut the cattails just below the water surface they will not survive - this plant needs oxygen to survive. The WeedShear will cut through cattails but does require some hard work. The AVG and the Lake Mower are the only tools that cut cattails with minimal effort). Cuts a 49" path. Includes 25' leash and hand sharpener. HOW good is The WeedShear? We Guarantee it! If it doesnt work better than any other aquatic hand tool on the market, OR if you are disatisfied with it in anyway, we will give you your money back. The handle arrives in 3 pieces with a total length of 9'. It comes with a hand sharpener to keep the tool effective. The WeedRoller moves in a slow, broad arc, pivoting more than 270 degrees. As it's linked rollers rotate along the lake bottom, the WeedRoller detaches existing weeds and agitates the lake bed. This prevents more weed growth, for a clean, sandy lake bottom and a pleasant swimming area. The WeedRoller easily attaches to any dock or can be set up on an optional tripod. For initial clearing, operate the WeedRoller continuously until the area is cleared.